The Gallery/Downtown (541 West 24 Street), houses the monumental (25 foot high) Tree. Constructed from weathered sections of dead trees that have been brought down from the mountains of Southern China and bolted together in the form of a whole, healthy tree with spreading branches, Tree is a totem that may be seen as a comment on the strength of modern China built from many ancient ethnic groups, or a determined attempt to create something new and vital from what is irrevocably lost. The show also includes new works composed from plastic LEGO toy bricks. Dropping a Han Dynasty Urn recreates with “pixels” of LEGOs Ai’s iconic triptych of black and white photographs depicting himself in the act of destroying a fragile symbol of China’s past. Self-Portrait, another LEGO work, presents an image of Ai Weiwei that adopts the bright color and repetition of Warhol’s silkscreen portraits. 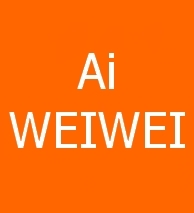 Ai Weiwei will have concurrent exhibitions in New York at Lisson Gallery and Jeffrey Deitch. The Mary Boone Gallery exhibition is on view at both Gallery locations – 745 Fifth Avenue and 541 West 24 Street – through 23 December 2016.